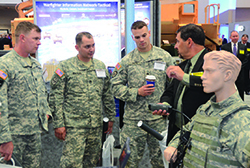 The Association of the United States Army’s Annual Meeting is the largest land power exposition and professional development forum in North America. Taking place over three days, the Annual Meeting is designed to deliver the Army’s message by highlighting the capabilities of Army organizations and presenting a wide range of industry products and services. AUSA accomplishes this task throughout the entire event by providing informative and relevant presentations on the state of the Army, panel discussions and seminars on pertinent military and national security subjects, and a variety of valuable networking events available to all that attend.